If you attended one of my writing sessions for 5th to 8th graders at the Soar with Your Dreams Conference today, thanks so much for signing up to hear what I had to say. Welcome to my website! As I mentioned during my talk, my love of writing started in childhood, so I completely understand the need to express yourself creatively at a young age. 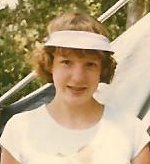 I'm even including a picture of me at thirteen, the age when I started submitting my work to publications and won my first writing award. No, I definitely wasn't the most popular kid in my school (not even close! ), but I was able to release all my fears and hopes and frustrations through my poetry and stories. Jump on some of these opportunities to submit your writing if you can, but please be very careful to avoid places charging fees. Kids should not be paying anything to get their work into print. If you have any questions regarding writing or my upcoming novel, please drop me a note in my comments section or find out how to email me through my contact page. I'd be more than happy to send you a reply when I have the chance. The only thing I'm unable to do is provide feedback on your work. Check with friends, family members, and teachers for help in that department, or join a group like Young Willamette Writers. If you know other writers your age, start a critique group of your own. That's what adult authors do. If you've arrived at this page for a reason besides the Soar with Your Dreams Conference, please pass along these links to the young writers in your life. With budget cuts trimming more and more creative classes in schools, our student authors need encouragement and support. So true about there being so many resources for young writers today! Glad to hear your sessions went well! I wish I had access to these resources when I was a kid! Writing back then pretty much meant scribbling stories in notebooks and trying to break into the adult market.